Many thanks to John from Guitar Listy for providing this guest post. Acoustic and bass guitars are among the most played types of guitar. But the question is, which one is suitable for beginners to start with? Selecting the right instrument is important when starting to learn the guitar. 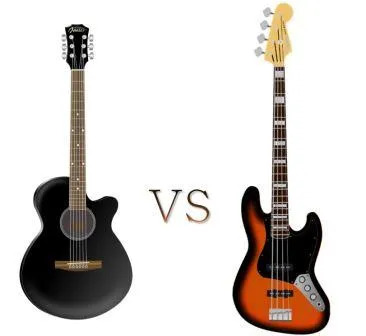 When someone is completely new to learning guitar, they aren’t likely to even know the basic differences that exist between acoustic and bass guitars. Both the instruments are similar in a lot of ways. But there are some significant differences too. The acoustic guitar is a 6-stringed instrument with its standard tuning being E-A-D-G-B-E. Its lowest string has been tuned to an E note (roughly 82 hertz in terms of frequency) and the next to an A note and then to D note, etc. But more than understanding the notes, it is quite necessary to know how the bass and acoustic are related. Standard bass guitars come with just four strings and are a bit larger in size. Its tuning is quite similar to that of the regular guitar’s lowest four strings. However, the only difference that exists is that they are tuned a whole octave lower in pitch. The bass guitar strings are tuned to E-A-D-G, similar to that of the lowest 4 strings on the acoustic guitar. But the low E on the bass is a whole octave lower (roughly 41 hertz). The bass in several ways is identical to that of the acoustic guitar – only having 2 fewer strings and been tuned to a lower pitch. The music theory, chords and scales learnt on one is also used in the other. Hence, both the instruments are related to one another directly. It is something essential to realize, since many players are of the opinion that they are to learn any one when starting out first. A direct correlation does exist between the two, thus making the choice somewhat stressful. It’s good to know that what is learnt on the bass, also applies to the acoustic and vice versa. The switch to one or the other can be made at any point of time – with a bit of work. This has of course only mentioned standard acoustic and bass guitars and standard tunings, but there are different types of tunings you can use on both the instruments and other variations. For example you can get 5 & 6 string basses and 7 & 8 string guitars. But there are other differences between acoustic guitars and bases, besides the basic ones outlined above. The bass guitar has thicker strings which offer a different feel and things that sound good on an acoustic guitar don’t necessarily sound good on a bass guitar – so the feel and the style in which they are played also differs – and along with this there are some techniques that are typically exclusive to either the bass or the acoustic guitar. Another big difference between the two is the role that each tends to play. Although both instruments are similar theoretically, sonically, some major differences do exist. Moreover, their roles noted in modern music are somewhat different. One question that comes to the minds of the young musicians is why a bassist is required in any rock band. The bassist is seen to just play in the background. With several bands and guitars playing heavily, the bass may not really be listened to by the audience! This is more so, if the acoustic guitarists are found to detune the frequencies that were once occupied by the bassist only. An experienced bassist is one who will know his job is to carry on the band. They form the backbone to help connect the other instruments being played. In genres such as blues and jazz, it means settling into the groove as well as to work along with drummer. For hard and metal rock, it means providing good amount of music. A bassist is that ultimate connection between the rhythm and melody of a song. They could be seen as part of the rhythm section and help a drummer to drive the rhythm, but they must also play notes that work with what the other instruments (such as voice, guitar, keyboard, sax etc) are playing. And the bass part of any song will help to drive energy, emotion and movement from their audience, even if the audience is unaware that the bassist is providing this. In truth, good bassists are quite precious. Hence, if the choice is to start with bass, then the person can proudly learn to play this instrument. Click here to know more about bass guitar. When compared to bass, acoustic guitar does come with a more varied role. Where bass and drums are regarded as the band’s rhythmic section, the guitar player is found to have more freedom to choose embellishments and off-script solos. The guitarist, in most genres, is also required to offer some rhythm support to the band. The person is not to be confused with the terms such as ‘rhythm’ or ‘lead’ guitar. Both these roles can be played by the same person. However, solos including other intricate pieces are played by the lead guitarist, while chords are mostly played by the rhythm guitarist. Two guitar players in most rock bands are to share such responsibilities or one is said to assume both the roles. When compared to bassists, guitarists are often considered to be more “musical” and tend to attract more attention in rock music. In many modern music forms, it is their solos and riffs that are found to be memorable. There is said to exist a genuine reason behind the creation of a video game named ‘Guitar Hero’, but none called ‘Bass Hero’. The job of the guitarist is to play great solos, come up with excellent riffs and also know how the proper and the correct rhythm is to be played when required. Again, as a bassist, the person needs to become the band’s very driving force and that critical connection between rhythm and melody and emerge as an unsung hero. The choice made to select a type should depend more upon individual preference and personality, as both can achieve success.